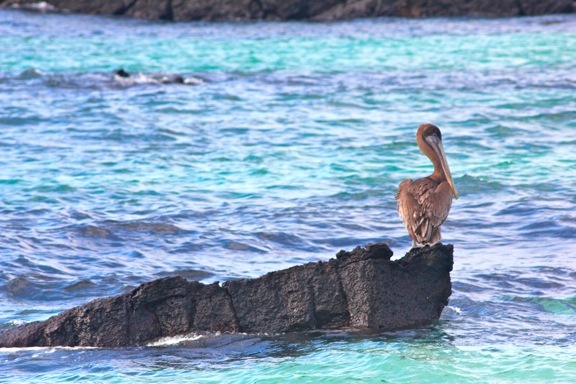 Our once-in-a-lifetime adventure to the Galapagos Islands began with a stop on Playa Ochoa, where we spotted the “Mystery Fish” featured in our previous post while snorkeling. 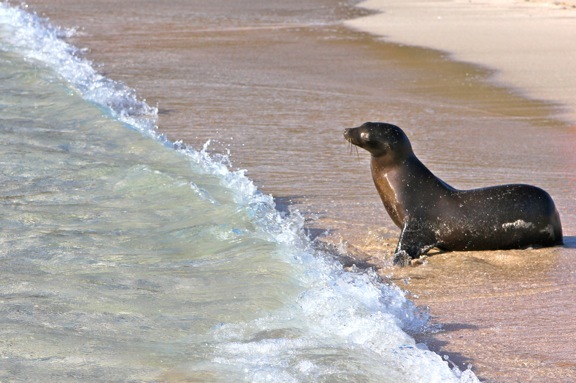 When we returned to the shore, we found this playful sea lion pup looking out to sea, with what appeared to be his mother keeping a watchful eye on his every move. 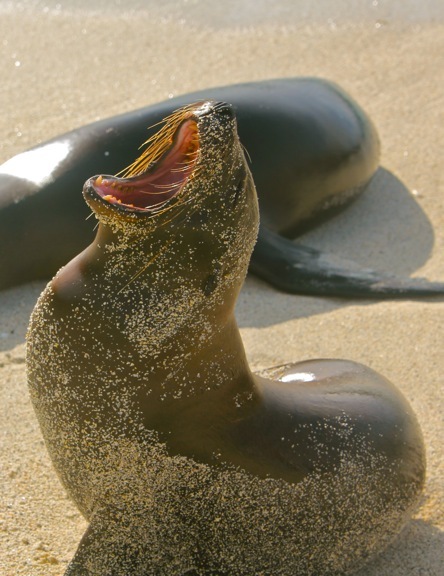 After this young Galapagos sea lion swam to shore, it created quite a ruckus, yelping loudly as it awkwardly waddled its way up the beach to greet several others of its kind as they rested beneath the shade of a tree. Before too long, it got bored and waddled its way back down to the water for an afternoon swim. 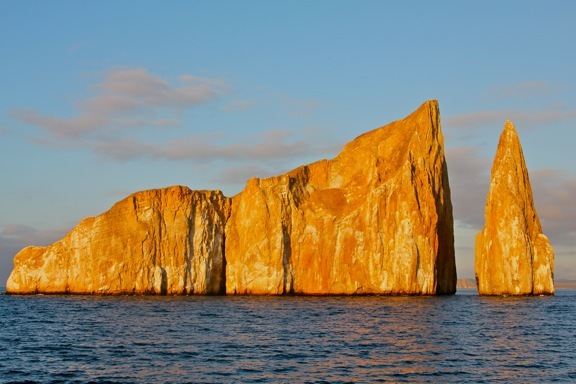 After making our way back to our ship, Ecoventura’s M/Y Eric, we set off to see the sun setting on Kicker Rock (a.k.a. Leon Dormido), a vertical tuff cone formation that juts up nearly 500 feet from the sea. The golden hour lit the rock up in multi-hued brilliance, making it easy to get great shots of the striking landmark. As the ship circled Kicker Rock, we got our first sightings of some of the remarkable bird species for which the Galapagos Islands are known. 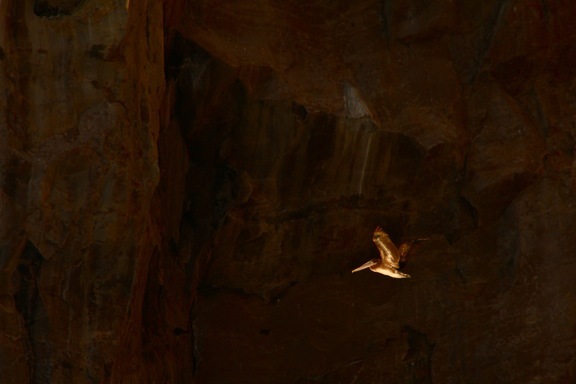 Using my 400mm Zoom lens I was able to capture this Nazca Booby (formerly known as Masked Boobys) coming in for a landing, and it almost looked as if he were hovering in the light. Sometimes, as a photographer, you get shots that look much cooler in print than you remember them being in real life. 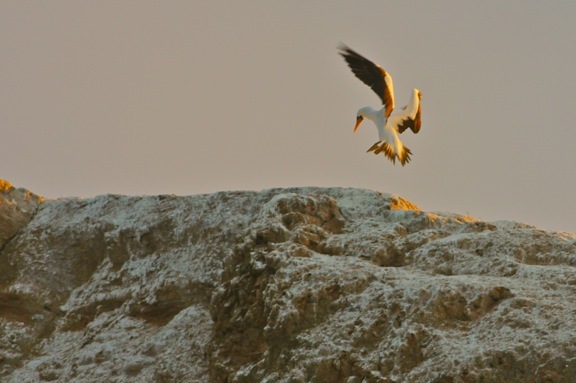 I’m still not sure how this Brown Pelican managed to be so perfectly lit by the setting sun, while the cliffs of Kicker Rock behind him were covered in shadow. 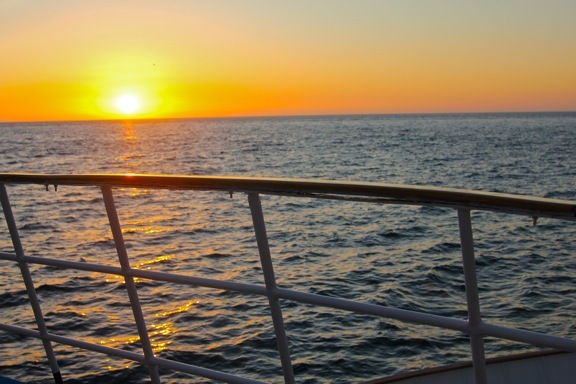 The Galapagos skies were cloudy for a significant portion of our week-long trip, but on the first night there wasn’t a single cloud to be found, making for a picture perfect sunset as we wound down our day with an evening cruise to the island of Genovesa (a.k.a. Tower). On our hikes, Naturalist guides Cecibel Guerrero and Yvonne Mortola split us into two groups, ensuring a great guide-to-guest ratio. 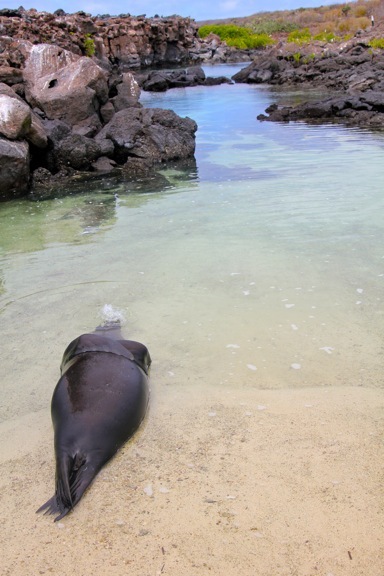 Here on Genovesa, we found a sea lion observing one of the Galapagos Islands’ strangest invasive species, keeping the recommended 6-foot distance between them as he examines their bizarre behavior. 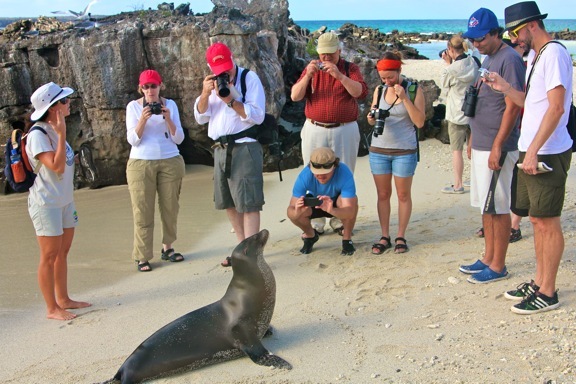 Never in my travels have I seen so many babies and juveniles of various species as we did in the Galapagos Islands. 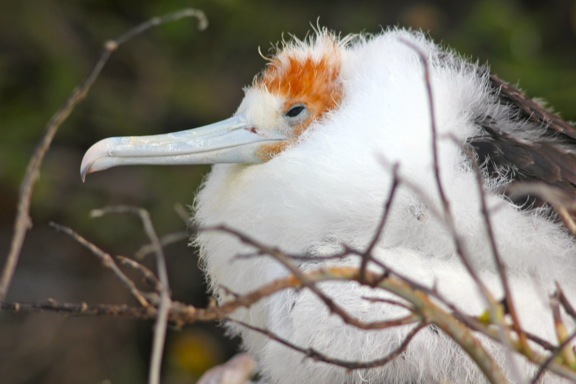 This young Magnificent Frigate looked like a huge fluffy cotton ball with a ginger-feathered head glued on top, like something Jim Henson might have dreamt up. He was just one of hundreds amazing creatures we found on our short hike. 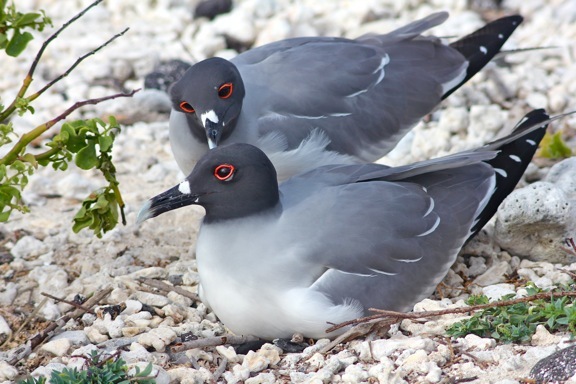 This is a breeding pair of Swallow-tailed Gulls, an endemic Galapagos species that also happens to be the only fully nocturnal gull and seabird in the world. The pairs frequently stay together, breeding year after year. I was spellbound by their crazy red-ringed eyes and the tenderness of their courtship, as they groomed each other’s feathers on the beach, not far from where another gull was tending to her young. 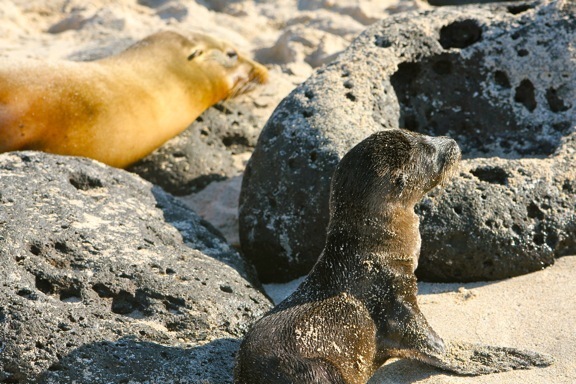 One of the most amazing things about Galapagos wildlife, aside from its sheer diversity, was how little the animals seemed to be disturbed by our presence as long as we adhered to the 6-foot distance rule. This lovely sea lion on the Genovesa beach almost appeared as if she were posing for the photographers in our group while her friends napped contentedly all around her. But eventually, she gave in and settled down for a morning siesta. I love boobies… and not just the human kind! 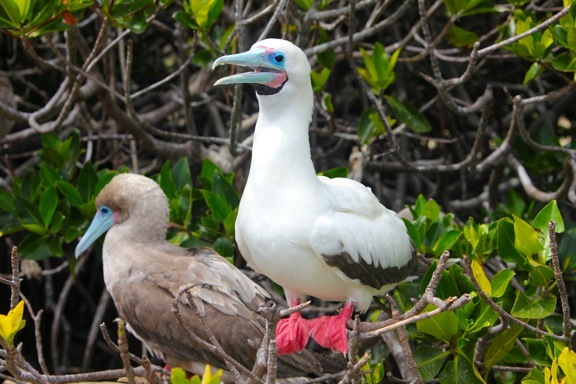 Genovesa gave us our first opportunity to see the Red-Footed Booby up close, and the vivid reds, pinks and blues of its feet and bill quickly made the smallest of the booby species a favorite photographic subject. Despite the different colors of their plumage, this mismatched pair were thick as thieves. 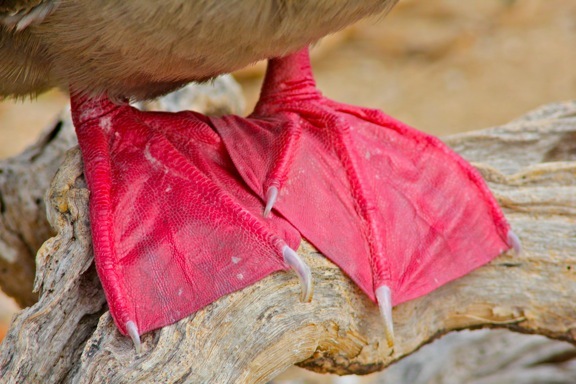 Because the other bird species had such distinctive identifying features– the feet of the Boobies, the spotted feathers of the Galapagos Dove, the red throat pouch of the Magnificent Frigate, the golden hues of the Yellow Warbler– I almost felt bad for the boring Brown Pelicans. This one really caught my eye as he sat on a rock out in the middle of the bay, almost looking as if he were in time out for misbehaving.